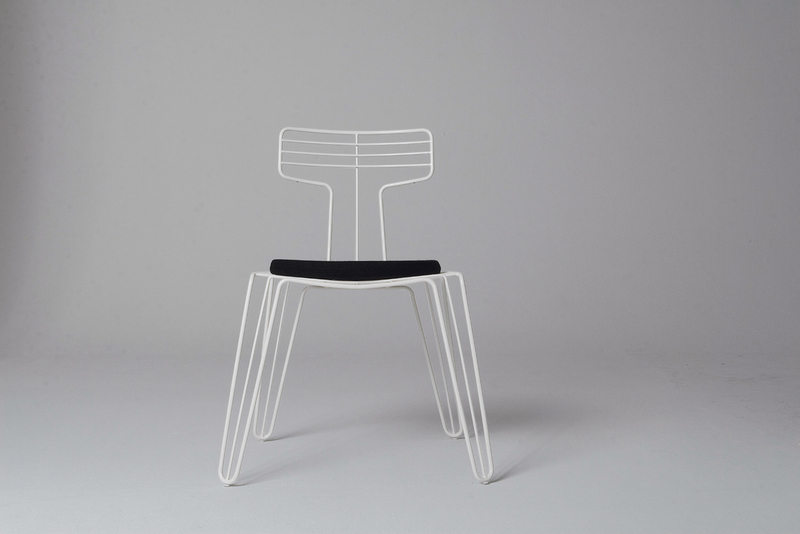 A dining chair from Tom Dixon’s Wire series, which includes a coat rack and stand. 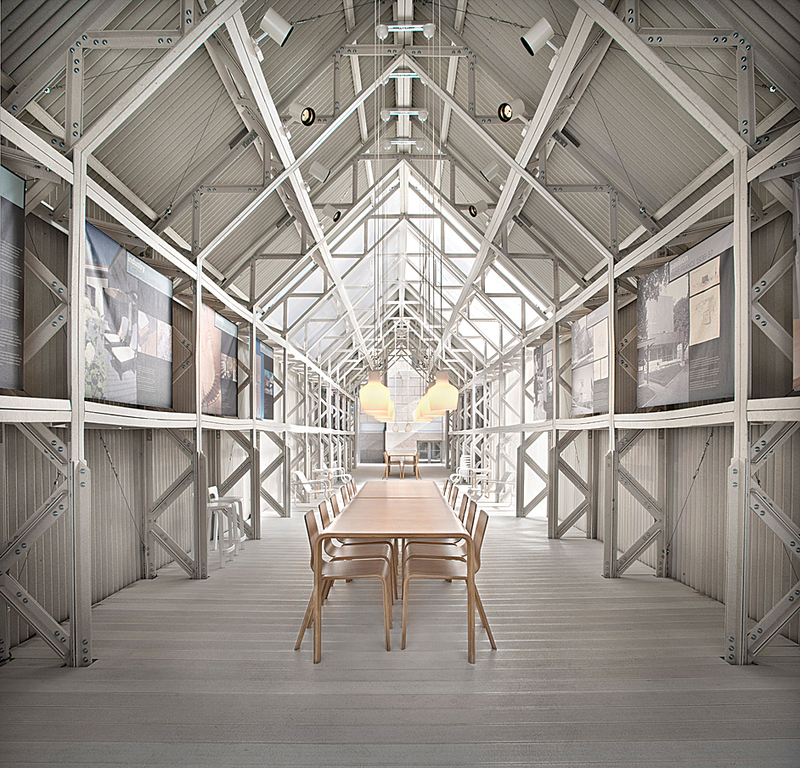 For the 2007 Milan Furniture Fair, Artek teamed up with the forestry company UPM to build a Shigeru Ban–designed pavilion. Constructed out of wood-plastic composite building material, which can be incinerated or recycled. 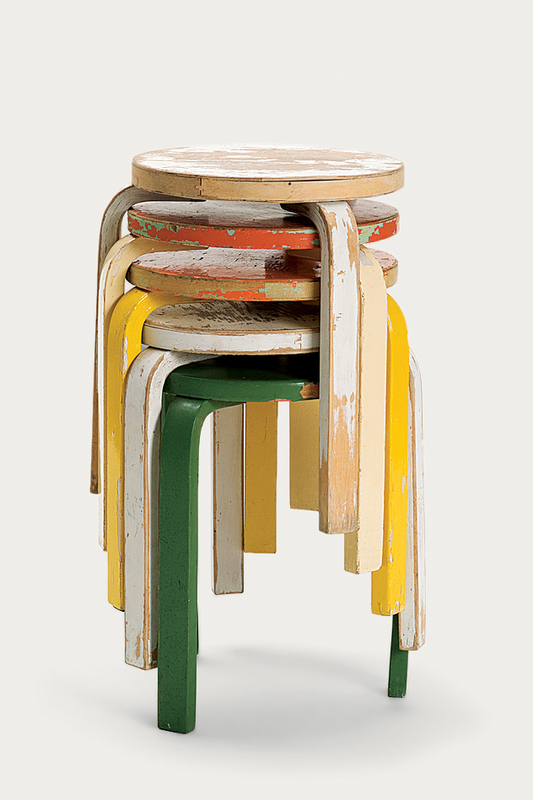 A stack of painted and worn Stool 60s, perhaps one of the most popular pieces from Artek’s archive, given new life in the 2nd Cycle series. Stool 60s, from Artek’s 2nd Cycle series, are embedded with coded RFID tags. The tags contain a link to records of the furniture’s history and origin. A Children’s chair N65, also from Artek’s 2nd Cycle series and also embedded with coded RFID tags. 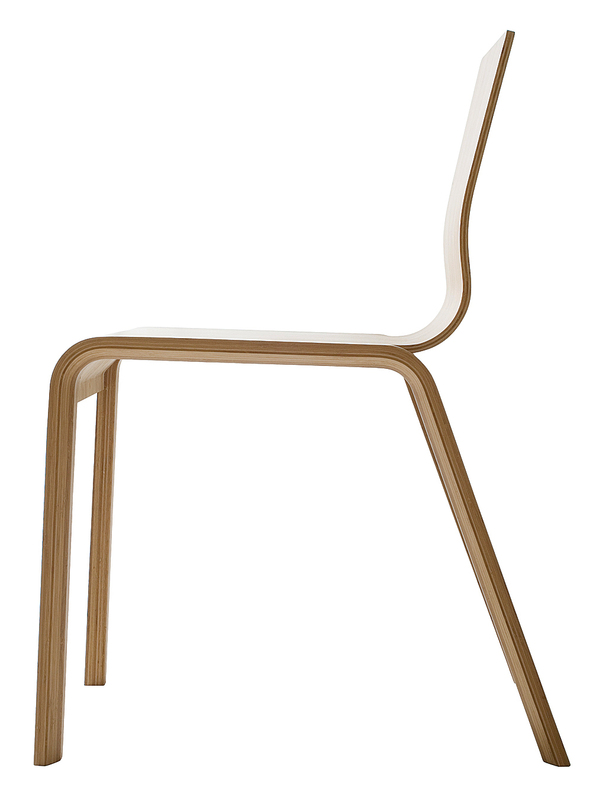 The stackable Bambu chair, designed by Henrik Tjaerby (2006), is part of Artek’s Bambu series. Tom Dixon’s Copper Shade pendant lamps reflect his background in metalwork. In 1935, Alvar and Aino Aalto, Maire Gullichsen, and Nils-Gustav Hahl founded the Finnish furniture manufacturer Artek (Art and Technology) to produce furniture, textiles, and lamps that upheld the main tenets of the International Style. Initially established to produce furnishings for Alvar’s architectural endeavors, Artek’s innovation in bent plywood became increasingly popular with the public both in Finland and abroad. For more than 70 years, the company has continued producing the same stock of quality products. 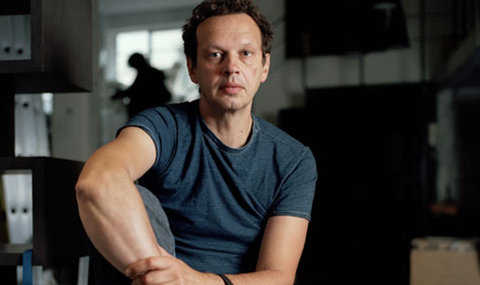 Tom Dixon—–the designer who claims to have fallen in love with welding because “it had none of the seriousness of craft and none of the pomposity of design; it was industry”—–seems at once the least likely and most apt choice to lead Artek into the 21st century. Dixon became Artek’s creative director through a partnership he and David Begg (who founded the Tom Dixon company) entered into with the private investment firm Proventus in 2004 to form Design Research, which owns and manages both the Tom Dixon and Artek brands. As he explained to Dwell in an interview, Dixon has set out to renew Artek’s commitment to innovation while exercising a healthy dose of reverence for its tradition, in terms of both sustainability and design. What was your initial approach in inheriting a company with as rich a heritage as Artek? When I first started working at Artek, I was consciously thinking about the positioning of the company. 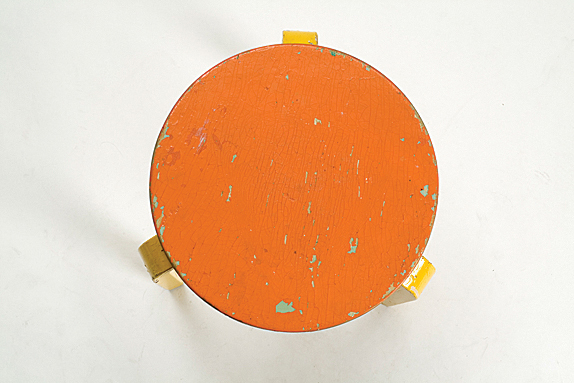 What I saw in Artek in the 1930s was the story of someone really innovating in wood and natural materials and adapting them to a kind of modernist theory, which had previously only been done in man-made materials. Alvar Aalto was looking to humanize this. The story is one of application of design and industrial process to a natural material and to an industry which, in the main, was very old-fashioned and craft-based. There are lots of layers of cultural heritage and parallels with architecture as well, given that Alvar Aalto was an architect and his secondary career was a furniture designer; I think that’s a unique proposition. With a company like Artek, for which birch plywood is so much a part of its aesthetic identity, something as simple as a material change is fairly radical. What was the impetus for this change? [I knew] it was going to be difficult to do anything more in plywood because in the intervening 50 years not much new had really been developed at Artek. The Americans, the Danes, and the Italians had all been making huge steps forward in bent ply; this innovation was no longer cutting-edge. If Alvar Aalto had really invented new ways of making furniture in bent ply, it had been very much superseded by the Eameses in the ’40s and ’50s. And even currently, there are companies like Gubi, for instance, that are using three-dimensional plywood to great effect as well. I felt like we’d lost the leading position, and we were somewhere like 50, 60 years out of date, and I had to find something new to bend rather than just a bit more plywood. Bamboo kept on cropping up as the outstanding contender. As a design material, how do you find bamboo to work with? It has a series of really interesting engineering properties in terms of strength and flexibility, and in the way that it grows so fast. So all we’ve done really is to spend three or four years understanding the material to try to make it into an industrial material rather than a craft material, which is pretty much what Alvar Aalto did with birch in Finland in 1925. Do you feel that this material shift in any way maligns Artek’s deep-seated tradition? There is no other [furniture] company that has survived from that era in its original form. The furniture [Aalto designed for] Paimio Sanatorium is still made by the same factory, with wood from the same forest, and sometimes actually on the same machine [that] produced it in 1929]. So we’re very careful not to undermine or destroy this tradition. But the new products don’t have to be made in Finland and don’t have to be made out of birch and don’t have to be modernist classics. I think it’s very important for a company that was as forward-thinking as Artek to regain some of that degree of innovation and newness. It was very important to me not to undermine the history, but also not to try to do new versions of what we’re already doing. You can take the principles of what something stands for and use them in a completely new way. Otherwise you’re just a retrospective company. You are self-taught and began your design career as a welder. How do you find working with wood? Well, I always found wood a tough material because you have to plan with it properly, unlike metal, which I can cut up and reweld in a different way. If I make a cut in a piece of wood, then that’s it. It doesn’t necessarily suit my impatient nature. But I’ve typically gone down a completely different route with natural materials, which is to look at the raw material first, like bamboo, and also other materials that we’re investigating, like recycled paper pulp, which I initially looked at as a furniture material, and which we eventually used for the Shigeru Ban–designed pavilion [at the Milan Furniture Fair 2007]. Many of your more recent projects seem to stress the importance of sustainability. Is this a primary concern of yours? You know, I’m no eco-campaigner, but I think we’ve all got a responsibility to start investigating alternatives. It doesn’t matter if you believe in global warming or not. What’s clear is that, in terms of what’s available for natural resources, we are running out. I think designers, particularly, should be in the avant-garde in considering their position on those issues. So anything that allows us to reduce the use of raw materials, anything that allows longevity in objects, is really legitimate in my view. Previous to being involved in Artek, I didn’t have a natural place to talk about these subjects, but now I can actually take an active role in trying to promote some of the things that I think are better practice. The 2nd Cycle series, for example, promotes the idea of not producing anything new at all. And people seem to be responding to this concept? I’ve been encouraged by the overwhelming interest in something as normal and as everyday as representing things that have got a bit of a past, a bit of age and heritage—–that they are more worthwhile and more valuable. Multiple platforms are run under the umbrella of Design Research. Do you identify most closely with the Tom Dixon label? [Laughs.] Well, obviously I have trouble separating myself from myself. It’s taken quite a while for me to make that distinction, and I feel I’m in a position which is interesting from a creative point of view because it presents interesting possibilities for manipulating myself into a sort of fanciful character. You can pretend to be something completely different. And also, there’s the other side, which is to have the opportunity to do things which aren’t in your own personal voice, which is what you do if you are a film director or a novelist. Yeah, very much. It’s not the same as doing your own designs, but it’s just as rewarding, if not more so, because you have more infrastructure and you’re dealing with the whole lot: the packaging, the information, the marketing, the object, and the sourcing and the rest of it. I’m much more comfortable in that role than [as] just a pure designer of objects for other people. You know, if you’re a designer, you end up as a servant to others where you have very little control over your output. It’s a bit like journalists, eh? You know, where an editor or an advertiser might trouble you to change something that you’ve written, you might be reduced, you might have to wait months to see what’s going to come out or not. I like being able to control all elements of the process. Obviously it all has its own set of challenges—it’s never that rosy.